Lake George is at the southern foothills of the Adirondacks - a massive, 6 million-acre park filled with year-roundrecreational opportunities that are perfect for a day trip. Whether you enjoy hiking, canoeing, leaf peeping, skiing, sledding, shopping, historical sites, or even just driving around taking in all the beautiful sites, you will not regret a daytrip or drive into the beautiful Adirondack Park. From Lake George Village, consider driving north up Route 9N to the historic town of Ticonderoga - it's only an hour away, and you'll be driving right along the pristine waters of Lake George, with plenty of scenery and some great pull-offs where you can take terrific photos of the lake. Following this route, you'll travel through Bolton Landing -- a prime destination spot with beaches, swimming, boating, and historic hotels, particularly the Sagamore Hotel. If hiking is your forte, the Cat and Thomas Mountains Preserves are just to the west of Bolton Landing. The Cat Mountain trail goes through a variety of terrian, including streams, wetlands, and beaver ponds. A little north of Bolton Landing as you continue on to Ticonderoga, there's also the Tongue Mountain Range, a popular hiking spot known for its spectacular, verticle 1,000 foot peak into one of the most clear lakes in the world. The range connects a series of peaks and runs nine miles along a peninsula. This hike is a challenge, however, so only tackle this one if you're an experienced hiker. If you're up for the adventure, take Route 9N to the Clay Meadow Trailhead, exactly 9 1/2 miles from the north end of Bolton Landing. Instead of driving up Route 9N you can take 87, where you'll have the opportunity to stop in Brant Lake or Schroon Lake along the way. Brant Lake is an excellent spot to enjoy fall foliage if you are leaf peeping during autum. If the weather is warm, you can swim or boat in the clear waters of the lake or take advantage of a bike route right around the lake. If it's winter, check out the extensive snowmobiling trails. Hit up Schroon Lake if you're looking for a popular, family-friendly destination. A number of activities can keep you busy here - boating, fishing, parasailing, water skiing, or hiking - there's also a beach and a public park. When you arrive in Ticonderoga you'll definitely want to stop to see the amzing Fort Ticonderoga. There, you can check out the exhibits and attend events, explore the exquisite gardens, and browse world class museum collections. Fort Ticonderoga is a truly significant piece of American history and it's in a beautiful location - right near Lake Champlain, with views of the Green Mountains of Vermont. Right across Lake Champlain from Ticonderoga is the Mount Independence State Historic Site. You can take the Ticonderoga Ferry, which is a quick seven minute ride with three round trips per hour running, if you'd like to visit both historic sites in the same day. The rural hamlet of Crown Point is just a little farther north from Ticonderoga - about 15 minutes - and is another historical landmark. Tour the Crown Point State Historical Site, immersing yourself in the Revolutionary War, check out the Crown Point Light House, or visit the Penfield Homestead Museum. For another option, instead of going north, head west on Route 9 to Route 28. You'll go through Warrensburg and North Creek, where you can continue on to Indian Lake, driving through beautiful forests. The Adirondack region is truly huge, with thousands of hiking trails and ponds, dozens of recreational opportunities, and plenty of dining options. One of the many treasures in the Adirondacks are the 46 high peaks, all of which are over or just about 4,000 feet and offer incredible views. Hiking up a high peak may be a bit of a stretch for a day trip, although it's doable with proper planning. But for sight seeing, certainly consider making the high peaks a part of your route. If you're simply looking to take a scenic drive there is no better place to do so than the Adirondack Region. 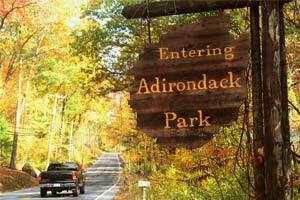 For more information on the Adirondacks, check out Adirondack.net.